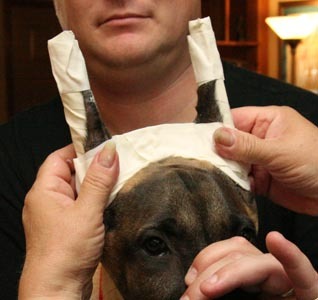 Below is a step-by-step process of how we are taping puppy ears. 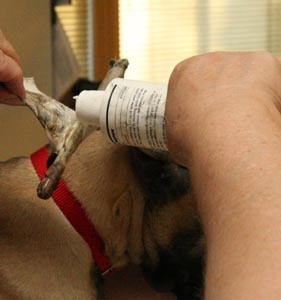 Skin Bond; an equivalent human-approved adhesive can be used. 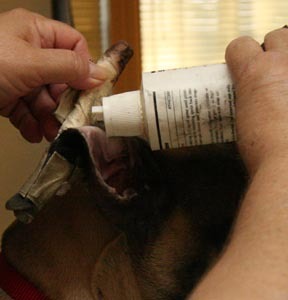 Glue remover is Unisolve. 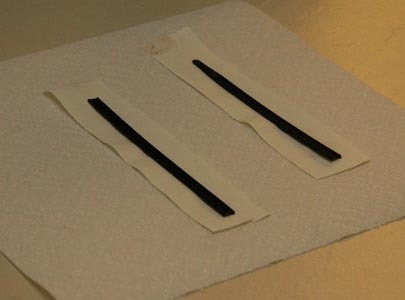 Long black items are cable ties. 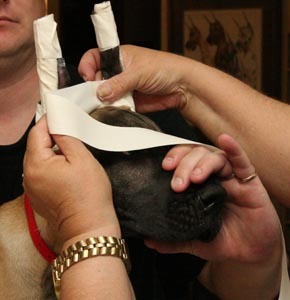 Johnson & Johnson Coach brand athletic tape..
Unisolve on existing tape loosens the adhesive. 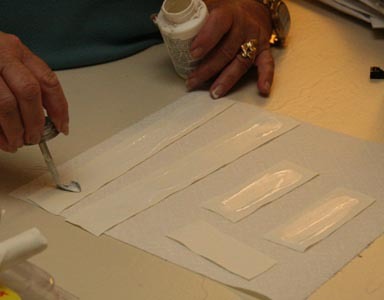 Put Unisolve on all tape that has glue on it. 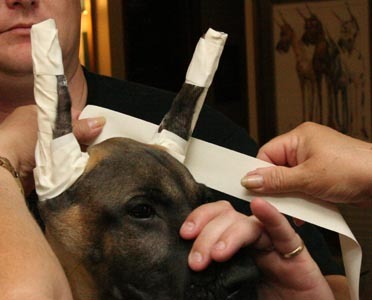 Cut off tape, making sure you don't cut the ear. 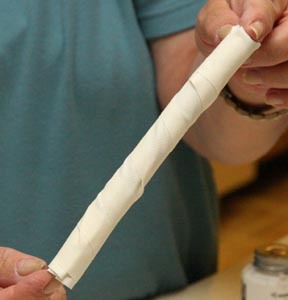 You can put your finger under the tape to loosen it & to find a path to insert the scissors. 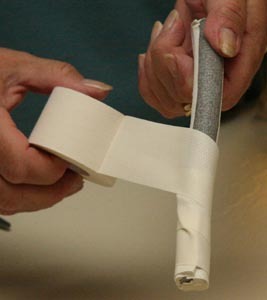 Cutting off the old tape. 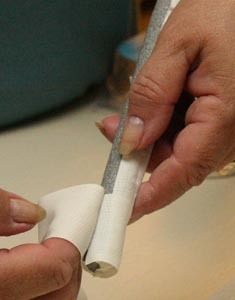 Cut tape - cut whereever it is loosest, not necessarily as shown. 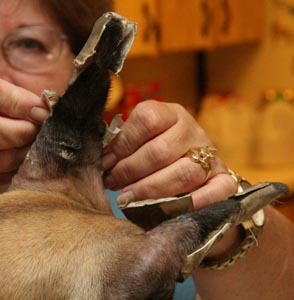 Peel back tape - already loosened with Unisolve. 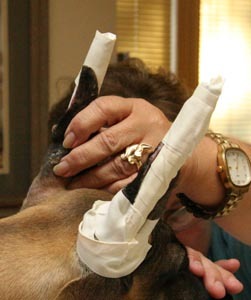 Remove tape slowly to avoid discomfort. Use more Unisolve on places still glued. 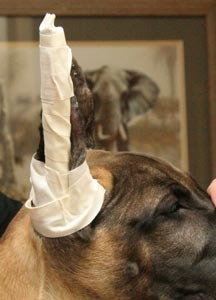 Put Unisolve at juncture of ear and stuck tape. 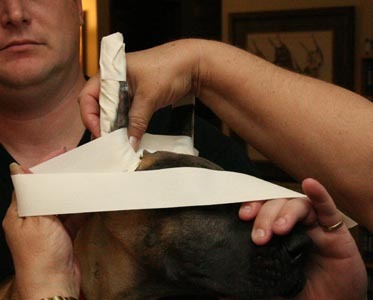 Unisolve makes the tape come off easily. 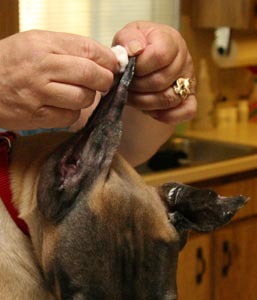 Clean ears with cotton balls and ear cleaner, such as alcohol or peroxide. 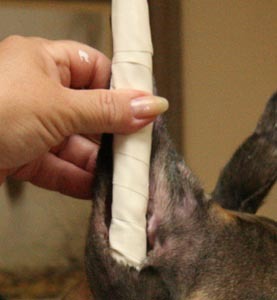 Clean off Unisolve - it will prevent the new taping from sticking well. 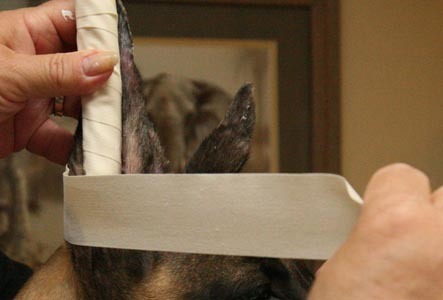 Measure how much foam you need. 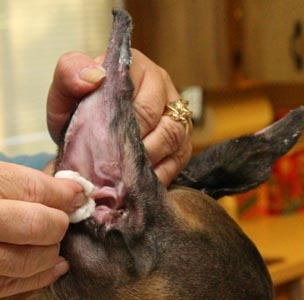 Foam should go from tip to deep in ear. 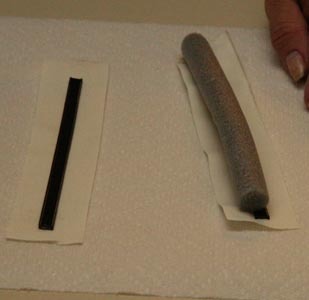 Cut a piece of cable tie about 1/2 inch shorter than foam. 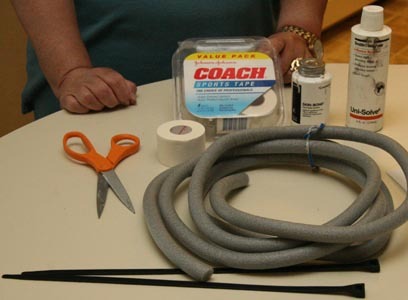 Start building prop: Lay each cable tie on a piece of tape longer than foam. 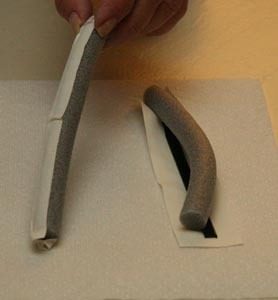 Lay foam on top of cable tie & tape. 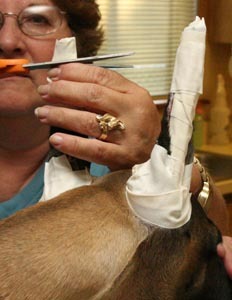 Making the prop... One end of foam extends 1/2 past cable tie - that end will go in the ear. 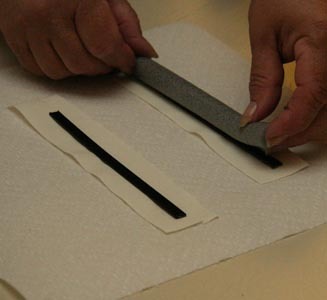 Use tape to hold the foam & cable tie together. 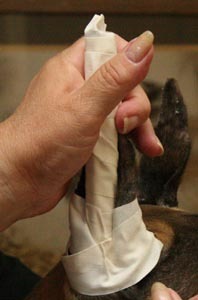 Begin backtaping prop by taping once around sticky side down. 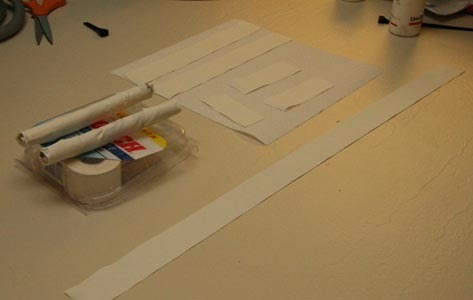 Bridge: 1 tape about as long as your arm, another short 3" piece. 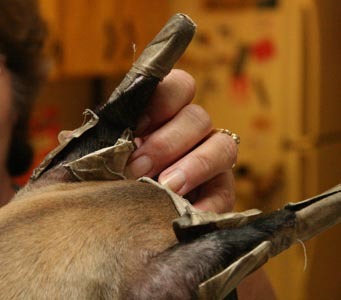 Apply Skin Bond glue the 2 long and 2 shorter pieces of tape. 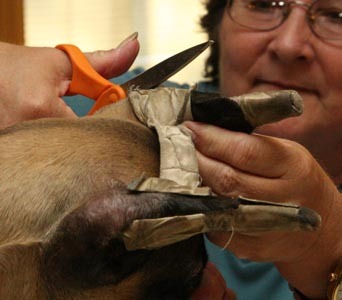 go against the ear - opposite the side with the cable tie. 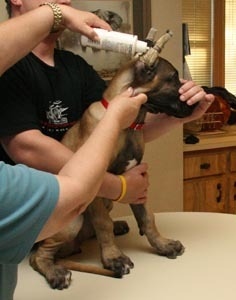 ear as far as possible. 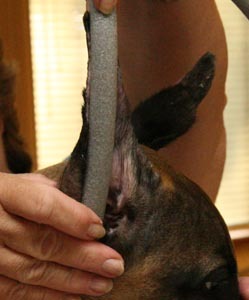 The glued side goes against the ear. 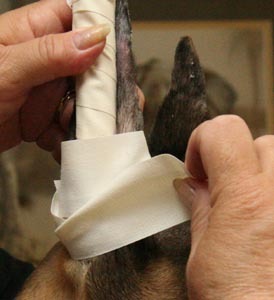 the ear, wrapping towards the outside, and then around to the front and inside. 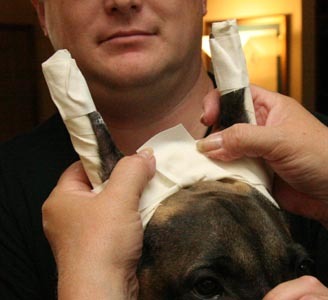 Make sure the "hole" at the base of the ear is covered with tape so the prop can't pop out. 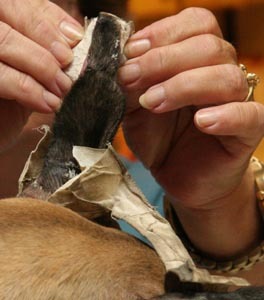 Note that the verticle ear fold on the inside/uncut edge is folded by the tape. 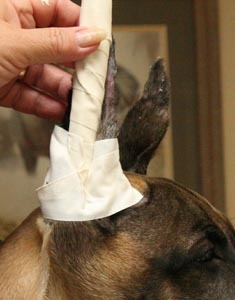 Wrap 1 small glued length of tape around the ear tip. as the puppy grows. 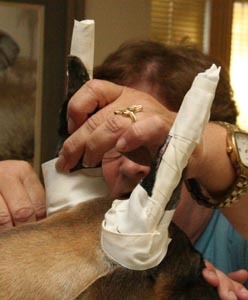 Press it to have the glue contact. 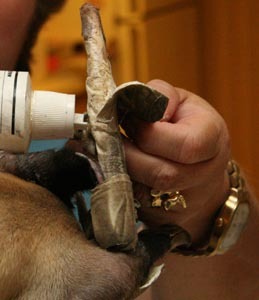 If the prop is too long, cut off excess. 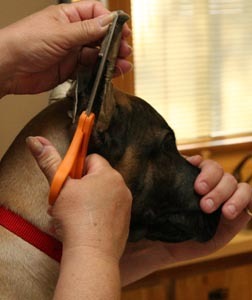 Hold the ear tip to make sure you don't cut it. 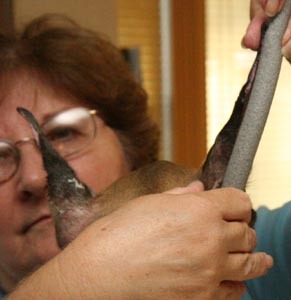 ear across the skull. The bridge tape does not have glue on it. middle of the base of the other. 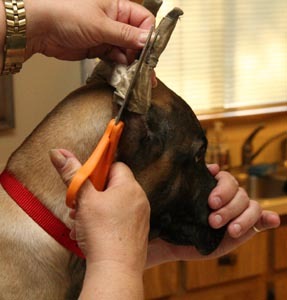 Go around the other ear. 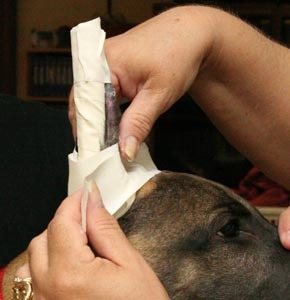 Go back & forth, sticking tape to itself across the skull. 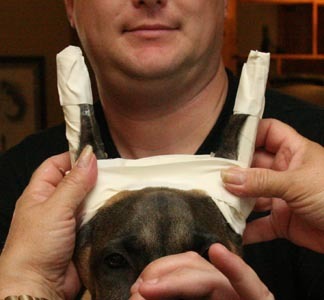 Use the smallest piece of tape to reinforce the bridge by taping around the tapes crossing the skull. 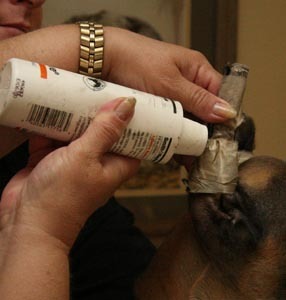 until the glue is well dry.